Recycling of steel scrap is receiving increased impetus these days due to the focus of an emerging environmental initiative since the increased consumption of scrap reduces the needs for additional resource extraction and hence reduces the environmental impact. Recycling of steel scrap is also a part of wise management of iron resources. Recovery of 1 metric ton of steel from scrap conserves iron ore, coal, and limestone. As per the world steel association, the integrated steelmaking route, based on the blast furnace (BF) and basic oxygen furnace (BOF), uses 1,400 kg of iron ore, 800 kg of coal, 300 kg of limestone, and 120 kg of recycled steel to produce 1,000 kg of crude steel and the electric arc furnace (EAF) route on average uses 880 kg of recycled steel combined with varying amounts of other sources (DRI, hot metal, and granulated iron), 16 kg of coal and 64 kg of limestone, to produce 1,000 kg of crude steel. On an average, recovery of 1 ton of steel from scrap conserves an estimated 1,030 kg of iron ore, 580 kg of coal, and 50 kg of limestone. Steel scrap recycling also saves the energy consumption. In the production of steel, 99.9 % of scrap melted is consumed in the production of new steel while producing negligible environmentally undesirable waste. Steel scrap is classified in three main categories namely (i) home scrap, (ii) new scrap, and (iii) old scrap depending on when it becomes scrap in its life cycle. Home scrap is the internally generated scrap during the manufacturing of the new steel products in the steel plants. It is also known as runaround scrap and is the material in the form of trimmings or rejects generated within a steel plant during the process of the production of iron and steel. This form of scrap rarely leaves the steel plant production area. Instead, it is returned to the steelmaking furnace on site and melted again. This scrap has known physical properties and chemical composition. Technological advancements have significantly reduced the generation of home scrap. New scrap (also called prompt or industrial scrap) is generated from manufacturing units which are involved in the fabricating and making of steel products. Scrap accumulates when steel is cut, drawn, extruded, or machined. The casting process also produces scrap as excess metal. New scrap includes such items as turnings, clippings and stampings leftover when parts are made from iron and steel during the manufacturing processes. It is usually transported quickly back to steel plants through scrap processors and dealers or directly back to the steel plant for re-melting to avoid storage space and inventory control costs. The supply of new scrap is a function of industrial activity. When activity is high, more quantity of new scrap is generated. The chemical composition and physical characteristics of new scrap is well known. This scrap is typically clean, meaning that it is not mixed with other materials. In principle new scrap does not need any major pre-treatment process before it is melted, although cutting to size may be necessary. Old scrap is also known as post-consumer scrap or obsolete scrap. It is steel that has been discarded when industrial and consumer steel products (such as automobiles, appliances, machinery, buildings, bridges, ships, cans, and railway coaches and wagons etc.) have served their useful life. Old scrap is collected after a consumer cycle, either separately or mixed, and it is often contaminated to a certain degree, depending highly on its origin and the collection systems. Since the life time of many products can be more than ten years and sometimes even more than 50 years (for example products of building and construction), there is an accumulation of iron and steel products in use since the production of the steel has started on a large scale. Since the old scrap is often material that has been in use for years or decades, chemical composition and physical characteristics are not usually well known. It is also often mixed with other trash. Due to these reasons, old scrap is the most difficult and costly form of steel to reuse. Incorporation into recycled products may require cleaning, sorting, removal of coatings, and other preparation prior to use. The large number of sources and forms of steel scrap requires the use of numerous scrap sorting and preparation processes to remove the contaminants and/or recover other valuable materials (i.e. non-ferrous metals) prior to entering the steelmaking process. Home scrap hardly need any preparation except that the larger pieces of the scrap may have to be lanced or gas cut to make the size suitable for its charging in the steelmaking furnace. Same is also true for substantial quantity of the new scrap. However some of the new scrap may need processing. Large items such as ships, automobiles, appliances, railway coaches and wagons, and structural steel need to be cut to allow them to be charged into the steelmaking furnace. This can be done using shears, hand-held cutting torches, crushers or shredders. Manual sorting obviously involves the removal of components from the scrap by hand. It is most suitable when miscellaneous attachments are to be removed from the scrap (i.e. radiators from scrapped automobiles, plastic end tanks from radiators etc.). The separation of metallics from non-metallics is also often accomplished manually. Wide range of equipments and processes are available for the reduction of the size of large scrap material into pieces small enough to enable consolidation, transport and subsequent feeding into the steelmaking furnace. The equipments and processes used to accomplish this are described below. 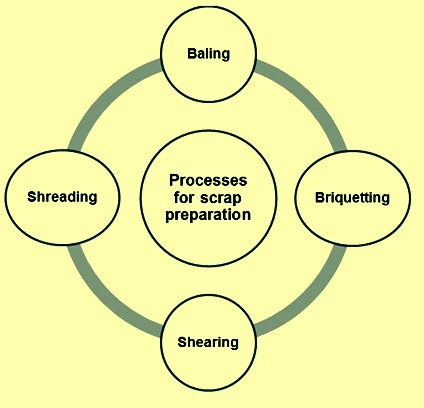 The mechanical processes which are normally employed to prepare the steel scrap include namely (i) baling, (ii) briquetting, (iii) shearing, and (iv) shredding (Fig 1). Chemical processes are also used in certain cases. Baling – In baling process, the scrap material is compressed in a powerful mechanical or hydraulic press, to produce dense, cubical blocks called bales. In baling press, loose scrap which has a high surface area and low density (i.e. lathe turnings) is compacted. A baling press is a heavy piece of processing equipment which uses up to three hydraulic rams to compress the scrap that requires higher density for charging in the steelmaking furnace. With 600 horsepower, the largest baling press can take three flattened autos without engines and in less than two minutes produce a bale of weight 2.5 tons and a size of 1 m x 0.5 m X 2 m. The advantages of baling process are (i) more weight can be loaded on a truck thus reducing the transport cost, (ii) more material can be stored in a given space, (iii) handling and storage of the scrap becomes easier, quicker, and systematic which in turn reduces the cost of handling and storing of the scrap, and (iv) a denser furnace charge is obtained. Briquetting – In a briquetting machine, small scrap is compacted into pockets as it passes between two counter rotating drums. Compaction can be assisted with heat depending on the material. Shearing – In the shearing process, the scrap material is chopped to length by a powerful blade of a shearing machine. The hydraulic guillotine shear slices heavy pieces of steel including I-beams, ship plates, pipes, and sides of railway wagons. Shears vary in size from 300 tons to more than 2000 tons of head force. The cheapest shearing machine is an alligator shear which can cut heavy melting scrap of 200 mm in thickness. Larger shears are even more powerful. Shredding – It is used for steel scrap which may contain other materials (glass, plastic, rubber, any non-ferrous metals, etc.) such as automobiles and household appliances. Hardened steel hammers or knives, driven by electric motors of enormous power, reduce the object to small pieces which can then be sorted, mainly by the magnets which remove the steel scrap and leave all other materials. Shredders usually have high capital and operating cost and are only justified when large amount of steel scrap is available on a regular basis to feed the shredding machine for processing. Shredding machines are also known as fragmentizers. They can reduce bulky scrap into fist-sized pieces using massive hammer-mills. A medium-size shredder uses 36 hammers weighing around 120 kg each to pound the scrap to pieces. Although the predominant raw material for the shredder is automobile bodies, ‘white goods’ (household appliances such as stoves, washers, dryers, and refrigerators) and other large items can also be shredded. Depending on its size, a shredder can process from 1500 tons to more than 20 000 tons of scrap per month. The shredding process produces three types of materials namely (i) ferrous metal (iron and steel), (ii) light fraction shredder residue, and (iii) heavy fraction shredder residue. The two residue fractions, either singularly or collectively, are often referred to as shredder residue (SR). ‘Shredder fluff’ is the term given to the low density or light materials, which are collected during the shredding process for cyclone air separation. Each ton of steel that is recovered produces about 300 kg of SR, comprised of plastics, rubber, glass, foam and textiles, contaminated by oil and other fluids. The ferrous metals are recovered by the shredder operator using magnetic separation. The SR heavy fraction contains primarily aluminum, stainless steel, copper, zinc and lead. The non-ferrous and ferrous metals are recovered from the SR heavy fraction. Heavy media separation and eddy current separation are the technologies primarily used to recover the metallic material from the SR heavy fraction. Magnetic separation is used when a large quantity of ferrous scrap is to be separated from other materials. Permanent magnets and electromagnets are used in this process. The latter can be turned on and off to pick-up and drop items. Magnetic separation process can be of either the belt-type or the drum-type. In the drum type process, a permanent magnet is located inside a rotating shell. Material passes under the drum on a belt. A belt separator is similar except that the magnet is located between pulleys around which a continuous belt travels. Magnetic separation process has some limitations. It cannot separate iron and steel from nickel and magnetic stainless steels. Also, composite parts containing iron are collected which can contaminate the steel melt. Hand sorting is often used in conjunction with magnetic separation to avoid these incidences. Eddy current separation process is used to separate non-ferrous metals from waste and SR. The process generally follows the primary magnetic separation process, and it exploits the electrical conductivity of non-magnetic metals. This is achieved by passing a magnetic current through the feed stream and using repulsive forces interacting between the magnetic field and the eddy currents in the metals. Inclined ramp separator represents the simplest application of the process. It uses a series of magnets on a sloped plate covered with a non-magnetic sliding surface such as stainless steel. When a feed of mixed materials is fed down the ramp, non-metallic items slide straight down, while metals are deflected sideways by the interaction of the magnetic field with the induced eddy current. The two streams are then collected separately. Variations of the eddy current separation process include the rotating disc separation, in which magnets are arranged around a rotating axis. There is also another process which uses a conveyor with a head pulley fitted with magnets. Both of these processes rely on the varying trajectories of materials either affected or unaffected by magnetic fields, to make the separation. Recovery of recyclable materials is often achieved using a heavy-medium separation (HMS) for the recovery of non-ferrous metals from shredder residue. This process utilizes a medium normally consisting of finely ground magnetite or ferrosilicon and water. By varying the relative proportions of the solids, the specific gravity of the medium can be adjusted. The specific gravity of the medium is typically half way between the densities of the two materials being separated. Once separated, the products/materials are allowed to drain, and the medium is recovered is then returned to the process. Any medium still adhering to the product/material is removed by a water spray. The resultant solution is passed through magnetic separators to recover the medium. The effluent is then reused as spray water. HMS process is generally conducted in an open bath to achieve a separating force equal to the force of gravity. For smaller particles, the forces of medium viscosity tend to work against the separating force. In these cases, cyclonic separators are used which result a separation at several times the force of gravity. Separation by physical and chemical characteristics utilizes colour, density, magnetic, spark, chemical and spectroscopic testing. Scrap materials are typically identified by skilled operators (sorters) using a limited number of physical and chemical tests. These tests rely on object recognition by colour, apparent density, reaction with chemical reagents, chemical analysis, magnetic properties, nature of spark pattern when ground by an abrasive wheel, and spectrographic analysis. Physical properties such as colour, density and relative hardness can be used to quickly separate certain classes of materials. For example, copper and brass can be identified by colour, while lead can be recognized by both its density and relative softness. Differentiating between alloys of similar grades and compositions can be difficult. In such cases, magnetic testing, spark testing method, and chemical and spectroscopic analysis are often used. Magnetic testing can also be used since iron, nickel and cobalt are ferromagnetic, as are low-alloy stainless steels. Hence, while magnetic testing cannot be used to differentiate between alloys, it can classify alloys into their series. Spark testing involves grinding an alloy on an abrasive wheel. The colour and length of the spark can be used to identify the alloy. There is a spectrometer which analyzes the spectra given off from the spark and compares it with standards to identify the alloy, but this unit is not truly portable and is therefore not widely used. However experienced spark testing operators can differentiate the material by observing the colour and length of the sparks. Various optical and X-ray spectrometers are being used to identify the composition of alloys. Thermo-electric testing involves using the Seebeck effect to identify materials. These thermoelectric devices contain two probes made of the same metal, one heated and one at ambient temperature. When they contact the scrap, a potential difference is generated which is the characteristic of the metal being tested. Chemical spot tests are also used whereby reagents such as acids are dropped on the metal and the reaction is observed. Quantitative chemical analysis is normally done to confirm the exact composition of the alloy. These processes are also known as scrap purification processes and are effective for the removal of tramp elements from the scrap. Many tramp elements dissolved in steel melts, e.g. copper, tin, antimony, and lead, are not oxidized in the presence of iron during the steelmaking process because of their low affinity for oxygen. This means that these elements cannot be removed from a steel scrap melt by a common pyro-metallurgical process, as is the case with silicon, manganese and aluminum which are oxidized and dissolved in slag. In order to remove tramp elements, scrap is required to be pre-treated at lower temperatures while it remains in the solid state. Pre-treatment of scrap in solid state has often the advantage that the tramp elements are present in pure state, either mingled with the ferrous portion of the scrap or existing at scrap surfaces, a fact which should facilitate their removal. Several steel products are being used with coating of other metal on them. Examples are galvanized sheets, tin plate etc. It is essential that the steel scrap generated from such coated products is stripped of the coating material before it is processed in the steelmaking furnaces. There are currently a number of processes used in industry for decoating of the steel scrap. The main source of zinc is galvanized steel sheet scrap. The zinc coated scrap included in the charge results in discharge of zinc oxide in the flue dust. Due to its high vapour pressure (71 kg/sq cm at 1600 deg C) most of the zinc evaporates during the steelmaking process. A zinc balance for an EAF shows that 97.9% of the zinc input escapes with the fumes, with only 2 % remaining dissolved in steel and 0.1 % in the slag. Although the removal of zinc at the scrap smelting stage is not problematic, it is useful if the dezincing of zinc coated scrap is done at a scrap pre-treatment stage so as to avoid the problems associated with recycling large amounts of galvanized scrap. The removal of zinc using thermal methods is generally carried out by using any of the following methods. The galvanized parts are heated to a high temperature (higher than 900 deg C) at which the zinc evaporates. The galvanized parts are heated to a temperature sufficient to embrittle the coating which is then removed by abrasion. The galvanized parts are heated and the removal of the coating is subsequently done by shot blasting. Zinc removal can also be carried out using chemical techniques in which ammonia leach or caustic soda is used to dissolve the zinc coating from galvanized scrap. Tin, which has a lower melting point, causes zones of weakness in the hot steel, leading to ‘hot short ness’ and other problems Tin bearing scrap (i.e. food containers and auto bearings) in steel recycling affects the surface quality of the steel products because tin segregates to the grain boundaries and causes surface scabs during working. Some of the processes being used for detinning the tin-plate scrap include electrolytic and alkaline detinning. The electrolytic detinning of tinplate scrap has been a commercialized process for a long time. Tinplate scrap is pressed into bundles with a density which is higher than 1.2 t/cu m. The bundles which serve as anodes in the electrolytic process are immersed in a caustic soda bath at a temperature of 85 deg C. Tin is deposited on a steel cathode as a sponge material which is then scraped off, pressed into large pills for its disposal to the tin industry. After detinning, the residual tin content which can be achieved in the scrap is as low as 0.02 %. Electrolytic detinning is economically efficient only if the detinning unit has an annual scrap processing capacity which is higher than 30,000 t of scrap. Also, electrolytic detinning is suitable for new scrap, but is problematic for old scrap. The tin coating on tinplate cannot be removed by mechanical treatment (e.g. by shredding). In the temperature range of 400 deg C to 550 deg C, the sulphidation of the coating with reactive gases featuring a sulphur potential and its subsequent removal as a brittle sulphide phase has been applied successfully on a laboratory scale. At present it is impossible to remove tin from steel scrap melts under industrial conditions. On the laboratory , tin was successfully removed by treatment with Ca-containing slags under reducing conditions as well as by vacuum treatment of steel melts at a pressure of 1 kg/sq m.
Copper cannot be removed from scrap-based steel melts by a conventional refining method. Several approaches to reduce the Cu content of steel have been proposed, namely, improvement of scrap sorting, dilution of contaminated charges by directly reduced iron as well as mechanical or chemical scrap pre-treatment aiming at impurity removal. Significant research efforts have been made to develop pyro-metallurgical decopperization techniques. It has been confirmed on a laboratory scale that copper can be removed by treatment with sulphide fluxes but a more promising method is the treatment of steel melts at reduced pressure of the gas phase. This method which consists of the selective vaporization of copper has been successfully tested on the laboratory scale. At present, investigations are being carried out to optimize the shredder operation with respect to the copper content of the shredder scrap. Preliminary results show that the copper content can be controlled by varying the degree of the shredder’s grid opening. With respect to sorting of scrap, it has been found that copper is most effectively removed my manual hand picking. Incineration process is often used for the removal of the combustible materials including oil, grease, paints, lubricants and adhesives. Some of the recently developed scrap sorting technologies are described below. Portable optical emission spectrometers are evolving as important tools for the on-site sorting and identification of metals in the steel scrap. Their analytical precision and accuracy, while not as good as laboratory installed spectrometers, are more than adequate for sorting mixes and most grade verification requirements. A portable spectrometer is capable of separating different types of steel in addition to separating at least 90 % to 95 % of the individual grades which make up each type of steel. Colour sorting is one of the first automated sorting processes to be used industrially, and it was developed by the Huron Valley Steel Corporation (HVSC), which is the world’s largest nonferrous scrap sorter. Over the last decade HVSC has used this technology to sort zinc, copper, brass and stainless steel. Colour sorting is based on computer image analysis, where the colour of each metallic piece is detected. Pieces whose colour lies within a specified range are automatically directed out of the feed material. In order for this to work properly, a singling mechanism is used to produce a chain-like profile of scrap particles before the image detector. HVSC’s colour sorting process has proven to be very accurate, producing metal purities over 98 %. This purity is possible because this sorting method is independent of particle size and shape. The technological advancement of computers over the last decade has greatly increased the speed of real-time image analysis. Due to the advancement of industrial colour sorting machines over the last few years, the ability to effectively sort different metals with slight colour variations has improved dramatically. Laser-induced breakdown spectroscopy (LIBS) is a scrap sorting process which determines the actual chemical composition of each piece of scrap in a fast and economical manner to achieve the highest quality of the scrap possible. LIBS technology was first developed by the Los Alamos National Laboratory in the early 1980s for a wide variety of applications. However, it was not until the early 1990s that this process was implemented for the analysis of solid metal pieces in a joint project with Metallgesellschaft. The results of this project showed the practical aspects of this process to accurately determine the elemental composition of metallic scrap. However, the focus of their project was on the identification of the matrix element and not on the complete spectral analysis of all elements in the scrap. While the process has many advantages, LIBS does have its limitations. The biggest drawback is that the surface of the scrap is to be free of paints, lubricants, or adhesives, since the pulse laser can only penetrate a depth of thirty angstroms or less on the surface of the metal. X-rays can also be used instead of a laser to illuminate the surface of the scrap. X-ray fluorescence (XRF) has been used for alloy identification, and a number of commercial devices, both portable and hand held, are already available.